Kampgrounds Enterprises, Inc » Spring Break plans? Try Camping at the San Diego Metro KOA! Home sweet KOA. It’s been awhile since I’ve been at the campground but it still feels like home to me. Even though this was my first time at the San Diego Metro KOA, the KOA campground brand simply brings me joy. Our family spent 6 months of 2014 living in and out of their campground locations all across the USA. I can absolutely see why this location was named KOA’s 2013 Campground of the Year! Now that the Carneys’ are no longer traveling by RV, the deluxe cabin is our camping accommodation of choice. We met the owners, the Bell Family, at their St. Louis location while on the road and they graciously invited me to stay for their Wellness Weekend last weekend. Unfortunately, I had to head home earlier than expected but I can’t wait to bring the entire family back here soon. It’s honestly a slice of campground heaven. 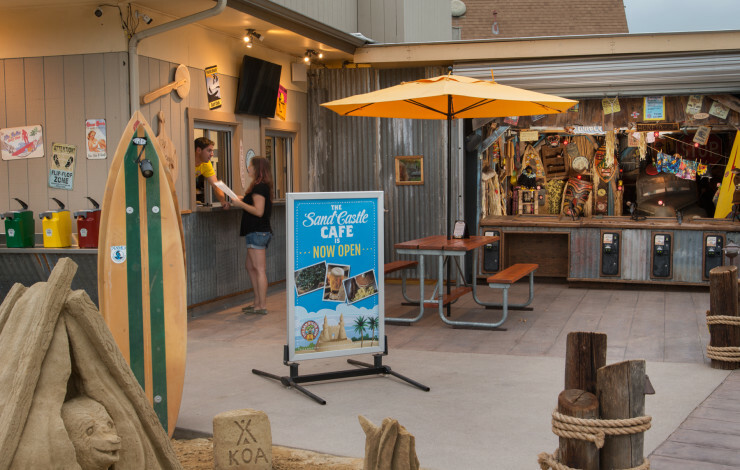 There are so many unique things about the San Diego KOA. Let’s start with the farm to table food at the Sand Castle Cafe. For dinner I ordered a turkey burger, that came with fresh fixings and delicious fries. This bowl of homemade granola was a treat for my breakfast. I just love the outdoor seating area too. I don’t think a lot of people get that camping isn’t like it used to be. You can be nearly as comfortable in the campground as you can at a hotel. This deluxe cabin features two bedrooms and a fun loft upstairs for the kids. The kitchen and living area are spacious, nicely decorated and clean. I loved waking up to the Keurig coffee maker! This was the first time I’d ever seen the Safari Tent accommodations. There are four of them on the San Diego property and I definitely want our family to try this out one day. There are two of them together toward the back of the park that I already told a friend that our families need to book together. The jumping pillows are my kids favorite KOA amenity and this location has two of them. There’s also laser tag and a rock climbing wall on the property too. The activity schedule at the San Diego Metro KOA is packed with fun things to do. The pool area, arcade, laundry and store are all well kept and clean. The playground, basketball and bike rental area at the front of the park calls out fun from the moment you enter the campground! There is also a four person unique ping pong table under the gazebo that looks like a lot of fun too. If you haven’t made spring break or summer getaway plans yet, try camping here. Your kids will thank you! Book your spot now as all accommodations are filling up fast and you can see why! Check out San Diego KOA’s upcoming camping events for the rest of 2016! Happy Spring Break to all!